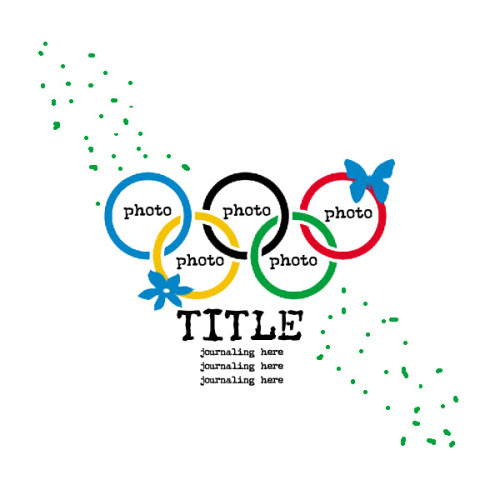 Last weekend the member of the Design Team of Scrapbook Challenges had a great time playing the OLYMPICS. We had fun games, Baton Relay, Swimming, Gymnastics and Modern Penthatlon Challenges. This is the original sketch tha "runner" # 1 of each team received. I was the third "runner" and this is what came out. The Olympic circles are almost lost here but our Team Time was wonderful and we WON!! Good morning ladies!! Today is my turn to post a challenge to you!!! The MODERN PENTATHLON!! As you know, it covers 5 sports in the same competition. My challenge to you is that you make a layout using 5 different techniques in your layout. Please list them when you post it! You can use these same techniques or choose your favorite ones!!!! I would love to see your wonderful creations! Hope you can play along! On Friday we will have the winners result, can´t wait!!!! The prizes for all this event were possible thanks to some very generous sponsors: Nikki Sivils, The Paper Trail, Lawn Fawn and The Cutting Cafe. Here is my challenge it's based on the feeling i get from watching Ballet. The rules,make a romantic NEW L/O,with flowers (can be cut out flowers,stamped flowers or other flowers)And use soft colors like pink,cream,brown,blue...the soft tones. And for the third day of games, fun, and challenges we had this one, hosted by Sookie: SWIMMING!!! For this last event, you need to make a layout/card that has swirls and transparencies on it. Your swirls could be those intricately cut patterns in a patterned paper or of course, a stamped swirls or those glittering Prima Swirls. I am not very good doing the romantic style layouts but I had fun putting all the flowers of the cluster togheter and cutting the velum! Thanks for looking!!! !like to express our warmest gratitude to these wonderful people for sponsoring the prizes. Your work is always amazing Carmen,great job. And congrats being on the winning team...!!!!!! Looks like a fun time, Carmen-and your LOs are fab! Amiga, adorei!!!!!!! Tá lindo e és super talentosa, como sempre!!!! Parabéns!! !